The Pyrénées are a natural border between France and Spain. Image courtesy of Wikipedia, see here. 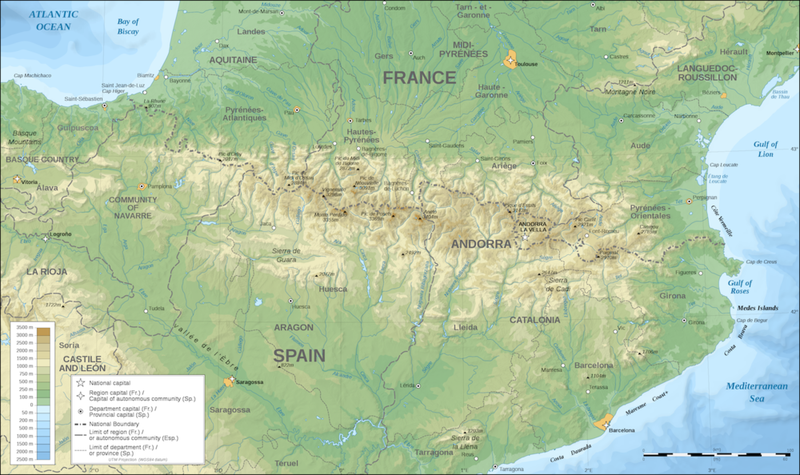 As the older brother to the Alps, the Pyrénées represent the collision between two great plates of the earth’s crust. The microcontinent of Iberia smashes against Eurasia. The former wrinkles, shears and protests before plunging into oblivion beneath the latter. It is a deep dive into hot mantle. Above, folds defiantly rise to elevations of 11,000 feet and more to face the wind, rain, and snow. This line of deformation runs for some 300 miles between the rolling foam of the Atlantic (Bay of Biscay) and the gentler Mediterranean. Mountain thruways are few and elevated. It is a choker around the neck of the Iberian Peninsula. 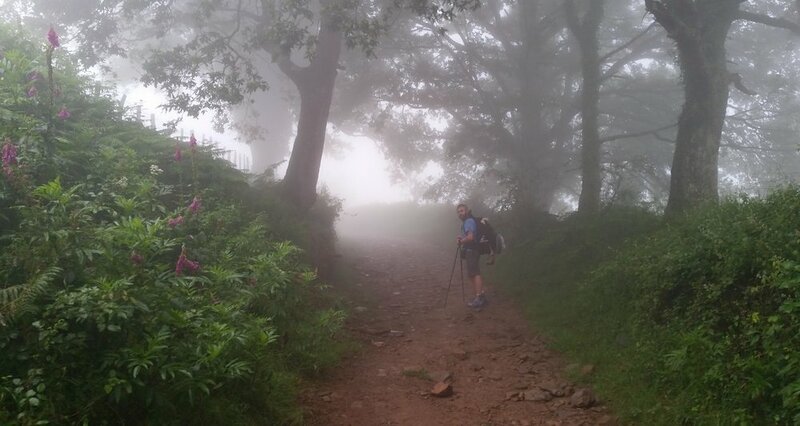 Bob and I choked and sputtered as we trudged upslope from Saint-Jean-Pied-de-Port, France (see post here). We got a head-start on the sun, but as it caught up with us, there was little to see. Everything was swathed in white. The marked trail followed asphalt and cow path. A heavy fog obscured our vision. We followed the old Roman route known as the Via Traiana. This Via once linked the gold mines of Asturica Augusta (named by Octavian himself at the end of the Cantabrian wars) with Roman Burdigela (modern Bourdeaux, France). In those days, the trail carried spitting legionnaires in hobnailed caligae. * Now the trace is worn by peregrinos** in Salomons and spandex. Bob and I were surprised twice. On the first occasion, our path was interrupted by cows. Because of the fog we heard them before we could see them. They chewed cud as we tiptoed through their ranks. On the second occasion the surprise worked both ways. We heard a startled snort. A huge hog stuck his head through the cloud curtain. Our eyes met. We jumped. He jumped. He squealed and crashed into the brush. We listened to his protests as they died in the distance. His fear was greater than ours; he was seeking to avoid the fate of a Spanish chorizo. We crossed the path of many sheep. They provided little surprise or entertainment. Military expeditions are not fond of surprises either. For this reason they favored the path under our boots. It ascends through open country to a 5,000’ pass on the western flank of the Pyrénées. A alternative route holds to a valley by way of the village of Valcarlos. While the valley ascent is more gentle, it is also fraught with potential for ambush. In fact, it was in this valley that the rearguard of Charlemagne was severed in the battle of Roncevaux Pass in AD 778. This Frankish “Alamo” gave birth to the legend of Roland, the doomed rearguard commander. *** Cooing his tragedy was a popular pastime among medieval bards. Above the tree line Bob and I stopped to snack. As we munched, the cloud cover that had obscured our vision was drawn back. We were served a marvelous vision. I appreciated it as part of the wonder of creation. At midmorning the fog began to clear. Roman soldiers hiking over this same saddle may have told another story around the campfire. Indeed, it is a different perspective altogether, one that twines the traverse with the perverse. It is captured by the first century poet Silius Italicus (and yes, that is a real name!). A splendid view into the heart of the heart of the Pyrénées! Once there was a beautiful young woman named Pyrene. She was the daughter of Bebryx, a local king. Bebryx offered to host the tragic hero Hercules, a decision that proved to be unwise. Characteristically drunk and lustful, Hercules violated the code of hospitality and ravished Pyrene. After giving birth to a serpent (the dark side of Hercules), Pyrene fled and exchanged the home that she loved for the desolate places. There, she was killed by wild animals. The Pyrénées are breathtaking but full of whispered stories. Néstor Martín-Fernández de la Torre, “Hercules Gathering the Stones of Pyrene’s Tomb amidst the Flames” (1909). Image from here (accessed 8/5/2018). *The caligae are the heavy openwork boots worn by Roman infantrymen. Ordinary soldiers are sometimes called caligati, “booted ones” or perhaps “groundpounders.” See the article by J.F. Gilliam here. **The Spanish word peregrino describes a pilgrim. It is drawn from the Latin peregrīnus and describes a foreigner, traveler, or pilgrim. It is often used to describe those walking the Camino de Santiago (or the Way of St James). ***The Song of Roland is among the most famous pieces of literature in the Western world. For an introduction, see Gerard J. Brault’s The Song of Roland: An Analytical Introduction (University Park: Pennsylvania State, 1978). ****I have drawn my quotes from an online version of Silius’s Punica found here.